The truth about the Gospel of Judas. Master Jesus: My brethren, I have the happiness to communicate with you. Interlocutor: How are you Master, It’s been a long time? Well “a long time” is a way of saying. Master Jesus: I am permanently with all of you. I Know why you have summoned me. There is a scandal due to the appearance of a gospel in which Judas was not the traitor who sold Jesus for some coins, but a privileged disciple who took care of the most difficult mission, to sacrifice him. This document, called in fact “The Gospel of Judas” has been aired by the National Geographic. The document is a papyrus found in Egypt in 1978 and its content and age were ignored until now. According to National Geographic the manuscrypt was radiocarbon dated, the ink, the writing style and the content have made reach the conclusion that it was written approximately around the year 300. Terry García, executive vice-president of this organization, qualified the document in a press conference like one of the three most important old texts discovered in the last century, along with the Dead Sea Scrolls and the Nag Hammadi texts. 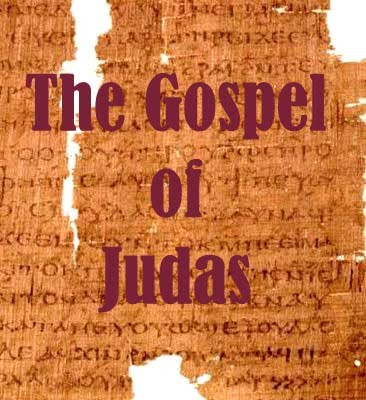 The existence of the Gospel of Judas was known by a reference made by the bishop Irenaeus of Lyon in the year 180 in his work "Against heresies", but nobody knew what it said until now. The book begins: "The secret account of the revelation that Jesus spoke in conversations with Judas during a week three days before he celebrated Passover"
Master Jesus: Brother, in fact there was a gospel- you call it like that- written in the year 120, according to your time. It’s a gospel written by the first Christians known as "Gnostics", those of the knowledge. Many things are true and and many others are not. It is true that I have said, but not only to Judas but to all my disciples that there is a God who doesn't mix with men. But I said it in a certain sense, so that I was understood in that time, because the Father, in fact, he mixes with human beings, from the moment he is inside of each human being. Master Jesus: I referred to the minor god of the Old Testament who did mix with men, he had interests, and he was possessed, regrettably of tremendous roles of Ego -I suffered because of that-, to such point that his behavior was similar to a spirit of the plane 2, and even to a spirit of the plane -2 in some cases. But it is not in me to judge the minor god, but rather I am simply exposing what I thought in that moment as a 10% incarnated. It is false that I could have preference by a disciple over the others, because even with John, my dear disciple I loved so much, I have also reprehended him in moments he deserved it. It’s not true I had more trust in Judas than the others. And it’s also something absolutely absurd that I had wanted to get rid of my physical role compromising karmatically to a being so that he delivers me. Interlocutor: But, beyond a special endearment, wouldn’t it be a better understanding of your teachings in some of your disciples ? I refer concretely to Judas. Master Jesus: Although what you say is feasible, in this case it’s not. First of all, Judas was at our side not only as one of the two accountants of our meager economy, but rather he was looking for a material Kingdom in fact. It would have been very simple for me to disembody in a thousand different ways without the necessity of compromising to another soul so that he delivers me and create him karma, because although he obeys my order that doesn't prevent him to create karma himself, since he is committing an act of betrayal. And although if it were due to obedience it still generates karma, because each one is responsible for oneself. He could have refused, of course in the case if that story were true. Interlocutor: This history, then, doesn't have any trace of reality? Master Jesus: No, not at all, and that writing was even rewritten, with different modifications, during the years 278 and 280 of this era, in Coptic language. And those are the papyruses that they have discovered and they have been assembled with techniques truly enviable to other times. Interlocutor: Let’s see if I understand. That reconstructed papyrus that has been found it is a kind of rewriting of another of the year 120? Interlocutor: And who wrote that papyrus? Master Jesus: They first Christian called Gnostics. Interlocutor: Was the previous text more plausible? Master Jesus: Yes, but always with that trend of giving more importance to Judas. Evidently these people were somehow looking for the Kingdom of my Father, but they were feeling subjected by the Roman yoke, they were interested more about a material revolution, and then they wanted to reflect the character of Judas taking him as a leader of the physical freedom, something that I have never proclaimed among my followers. This is certain because in more than an opportunity I have said that my Kingdom was not from this world. And I didn't mean to “my” Kingdom as mine, but to the Kingdom that I had discovered through visions. Master Jesus: Judas was only one disciple more and several times I have exchanged words with him because he faced me with insolence. If there is something he had, contrary to the other apostles, it was that he had the propensity to not having the decorum that the other disciples had, the respect that others did have to me. A respect, on the other hand that I didn't want, because although my dear disciple has always proclaimed that respect is part of the personal love, the fearful respect is not part of this Love. One thing is the respect for love and another very different thing is the respect for fear, which is the one that most of the apostles had towards me. And fear of what? If I proclaimed Love continually! Each second, each breathing, I proclaimed Love, and Judas have no respect towards me, and then he rebuked me directly. Perhaps this has been seen by many witnesses, and then they spread it like rumors and the Gnostics surely took them, Judas had a different trust with me, but a different trust that he himself had taken, not that I had given it to him. We are speaking of a disrespectful trust, because being incarnated, I gave trust to everybody, I hugged everybody. We are speaking of that disrespectful trust even doubting of some things that I proclaimed. Do you understand what I mean? Master Jesus: This is what the Gnostics have seen and they have interpreted erroneously as if Judas had a bigger prominence than the others, but it was a disrespectful prominence. Interlocutor: Is it clear, Master. But where do these gospels come from? Were they dictated by the spirits of error? Master Jesus: In some cases they were dictated by the spirits of error and in other cases they emerged directly by vested interests. Interlocutor: Have the Spirits of Light also influenced? Master Jesus: No, never not the Spirits of Light. There were vested interests that the embodied beings had to somehow distort the messages. Interlocutor: I ask it because some things that these papyruses say are interesting. Master Jesus: Here the only interesting thing that has transcended, it’s what I said to the apostles about the God I communicated with, to whom I call my Father who doesn't mix with humans. Him transcends beyond all of that. The Absolute doesn't look for rewards because the Absolute doesn't need anything. The Absolute is Everything. That is what people of that time didn't understand and even today XXI century , they don’t understand it. Interlocutor: I don’t know if you said it or not, but it didn't transcend the issue that Yahweh was only an Eloah, one of the Elohim. Master Jesus: I didn’t say it clearly, but yes I have said it, and it is in that papyrus that my Father- so I called to the Creator-. he didn't have anything to do with that god that mixed with men. That was said clearly. Interlocutor: But in this papyrus that idea was influenced by the spirits of error? I say it because we know that the spirits of error, in order to be more believable, they tell some truths mixed with falsehoods. Master Jesus: Correct, they have transmitted truths with distortions. Interlocutor: Did Judas betray the historical Jesus then?, let’s call in that way to the role you played two thousand years ago. Interlocutor: Was it a vile betrayal in fact? I ask it to know if he was pushed somehow so that anyone could have succumbed. Master Jesus: He was not pushed more than his ideas. Interlocutor: Do you mean that only his ideas were pushing him and not the Sanhedrin? Master Jesus: When Judas finally digested that to me the only thing I was interested in as an incarnated being was to show the Love for the others and that it was the only way to reach the Kingdom, he began to create resentment in himself and he was invaded by his roles of ego tremendously. I couldn’t talk to these people about spiritual planes and spiritual vibrations because they would not understand. Interlocutor: That is to say that somehow Judas turned around, to express it in a concrete way? Master Jesus: Correct. He ended up having a kind of hatred for everything I preached about because he wouldn't take out anything clean. He felt as if he were a slave of a bigger politics and that the only way to be freed from that slavery was fomenting a revolutionary movement, thinking that I had the power of attrating people to create a revolt. And for this reason not only he delivered me, but rather –and this is a novelty because nobody knows it-. He has fomented in the Sanhedrín the idea of a revolution on my behalf. He wanted them to catch me saying that I was a revolutionary saying that I wanted to create a revolution in Judaea against Rome. Interlocutor: According to your explanation, I have to deduce that if it weren’t for Judas you wouldn’t have been crucified. Is it correct? Master Jesus: In fact there were rumors already saying that I was trying to disturb the peace, but Judas somehow fomented more that idea. Interlocutor: Could we say that it was the drop that spilled the water? Master Jesus: Sure. But what a paradox!, because Judas himself astray from me when he realized that I was not fomenting any revolutionary movement, and he said the opposite thing to the Sanhedrín. In his feverish mind, in his fantasy, when he saw that his desire of uprising was stopped, then he transfered it to me. Do you understand what I mean? Interlocutor: Yes, Master, it’s perfectly clear. Master Jesus: Those feelings of rebellion were transfered to me and he communicated to the Sanhedrín saying: “I come to denounce a fact, of somebody who is an agitator”, when in fact the agitator spirit was him. Master Jesus: I have had more than twenty personal conversations with Judas, but not because he had a bigger influence on me than the others, but because he had that disrespectful way to confront me, something that the other disciples for respect would not have dared to do it. Remember when John Zebedee, at his young age of 16 years old, shaked my arm angry saying: "Those people are rebellious, you have the power to communicate with the Father, Why don't you turn them to ashes? ", circumstance in which I took his ear, and I shook it to reprehend him affectionately, but also a little bit angry, when I saw that John wasn’t learning. Interlocutor: I remember that episode. Master Jesus: One thing is what John did by the innocence of his short age, and another thing is what Judas did, working behind and fomenting resentment, more resentment, distorting his idea, transferring it to me, and agitating the Sanhedrin. This is the reason of his ungodliness towards me. Suppose you are in the place of the Sanhedrín, How won't they be suggested with a rebellion if one of my own disciples is saying that I, apart from proclaiming me a new god, I was fomenting the disorder and creating an armed rebellion? Master Jesus: How won't they want to turn off that flame that my incarnated part was? In addition, from the different temples they looked for a way to silence me because I treated several mental dysfunctions that made sick to the body, and it was like I was removing people from the temples and for this reason they could not receive from them the traditional tithe. As you say, they already had me "targeted"
Interlocutor: All of this would give the idea that Judas in his incarnation of that time was a disastrous character. is it correct? Master Jesus: In the end his resentment could do more, but at the beginning he was an idealist with a great desire to grow up, with a great desire to cooperate with our group, but then, when he saw that his seed,which was the seed of rebellion, was not giving fruits he turned around 180 degrees, as you say in the earthly plane. Interlocutor: And he put himself against you. Master Jesus: Correct, but I understand it. It’s not true that I have said that the one who betrays me, It would have been good for that man if he had not been born. Interlocutor: Didn't you really say that? Master Jesus: No, for a simple reason. Each incarnation is to revert certain karma. If the person doesn't learn his lesson, and in that incarnation he leaves with more karma than he had before, he will have a next incarnation to repair that mistake and to learn a new lesson. But saying:“It would have been good for that man if he had not been born” it is as if I prevented that person to embody again to learn that lesson. All are experiences. It would have been a flaw on my behalf, a tremendous blunder, if I had said that. This must be reasoned by those who follow me, it doesn't matter which religion they belong. Interlocutor: In which spiritual plane is Judas at this time? Master Jesus: He’s in the plane 3 and with a great desire to grow up, but his spirit has always a feeling that would be like a double message. On one hand, he wants to help and on the other hand he has a lot of complaints. And sometimes he doesn’t accept the orientation of the Spirits of the plane 5. At moments he rebels. He try to rise himself and then he lowers. He is in a continuous turn. And one cannot force the free will that the Father gives to all of us. Interlocutor: Did Judas really commit suicide? I ask it to confirm it so that there is no doubt. Master Jesus: Yes, that’s right. Interlocutor: What was the real reason? Master Jesus: It was a logical issue of remorse, for a sense of guilt that was also produced by his roles of ego. You know that the roles of ego take place from euphoria to the most absolute depression. He felt tremendously guilty. Interlocutor: Did he look for way out from that depression through suicide? Interlocutor: Did he hang himself? Master Jesus: Yes, he did. Interlocutor: At the same moment you were crucified? Master Jesus: Judas disembodied some hours before me. Interlocutor: Did he go directly to the plane 3? Master Jesus: No, not to the plane 3, he went to the plane -2, the Eighth sphere. Interlocutor: Which were the reasons he lowered to the lowest vibratory plane? Master Jesus: Judas had a tremendous resentment added to a gigantic depression produced by an immense repentance. That remorse at moments was not such remorse, because he transferred faults to others and he considered that that situation would not have to happened him. Interlocutor: Anyway, leaving the plane -2 and rising to the plane 3, it’ an entire success. Master Jesus: Yes, brother, that’s right. I Repeat that I’m sorry about his pain very much… he was a wrong person... my dear disciple in this case Johnakan already said it,. The enemy of goodness is indifference, indolence, everything that avoids commitment. Interlocutor: I believe that the topic about Judas is clear enough, but I want to take advantage of the occasion to ask you about something that many people have asked me, and it is related to the consequences of suicide. Where does the spirit go concretely, when the suicidal person disincarnate? I mean if he continues in the same plan or he lowers, because what I want to know is how impacts the fact of committing suicide in the spirit. In the case of Judas I think that it was not necessarily his suicide the one that made him descend to the Eighth Sphere, but an accumulation of negative acts. Master Jesus: Of course, brother. Interlocutor: To clarify better my question I’ll give an example, let’s suppose that a very good person due to diverse circumstances commits suicide. Does he return to the same plane or he lowers from plane? Master Jesus: There is a very logical explanation. Every person who is taking the life of another person is causing a pain in the physical plane to those that are hooked up in personal love to the one who has died, and then that murder in many cases makes that the killer lowers from plane. In suicide the case is similar, because the murder is made by the own suicide against himself. You will tell me that it should have attenuating circumstances in those extreme cases of depression, where the person's mental decoder is so damaged in that moment that he ignores the act, and that he will surely have another evaluation. Interlocutor: For example, somebody who is being tortured and in despair he commits suicide to relief himself. Master Jesus: In that case he surely doesn't lower of plane, but those who commit suicide without having that extreme suffering, they can descend from plane, for example due to loneliness or because they have had some loss. it is another type of karma they have to learn. They have to learn how to complete their cycle. Interlocutor: After that incarnation in which Judas committed suicide, Did Judas embody again? Master Jesus: Yes, he embodied several times again, in the century III, in the century V, in the century VII. Interlocutor: Was he somebody well-known in some of those incarnations? Master Jesus: No, not at all. Interlocutor: Did he make the same mistakes again? Master Jesus: In the century III he did. He was a person who was seeking to manipulate to others, a scholar of all that was related to Christianity which was being gestated in that moment. Even in that century III he had studied the character of Judas and sympathized with him. Master Jesus: Ignoring that he had been Judas in another incarnation. Interlocutor: Did he lower again to the Eighth sphere? Master Jesus: No, not to the plane -2. Interlocutor: I want to clarify the idea I have that the spirit that is in the plane -2 cannot embody. Master Jesus: The spirits can embody from the different spiritual planes even from the plane -1 (the plane of Solitude). But not from the plane -2 (Eighth Sphere). Even Angelic entities from the plane 6 can embody, but not the Divine Energies of the plane 7nor Entities of the plane 8 (Elohim) obviously. Interlocutor: Concretely and to make it clear: Only spirits and angelic entities can embody. Master Jesus: Correct. The spirits of the plan -2, I repeat, they cannot embody, but spirits of the plane -1 can embody, but in this case the incarnated person practically doesn't have any guideline from his thetan or 90%. Interlocutor: There is a topic we have never talked about and it’s related to your previous incarnations. Master Jesus: It’s not true, being only an “urban legend”, as you say in the physical plane that I have also had previous incarnations in other beings called “avatars”. Discard it completely. Yes, I have had incarnations in this planet but also in other planets. I have never made mistakes, I have been a spirit who in all my incarnations I have given messages of Love. But I have passed unnoticed, as a good loving husband, as a good directive. I have embodied in the old Greece as a teacher who has helped young people to think, something similar to what Socrates did. Interlocutor: Don’t you appear at all in history books? Interlocutor: And how about those so well-known names that they syndicate you as your reincarnation? Master Jesus: Discard it totally. Interlocutor: Did you embody some time as a woman? Master Jesus: Yes, I embodied as a woman also. Interlocutor: How many incarnations did you have? Master Jesus: In fact I had few incarnations, in total nothing more than twelve. Interlocutor: For some special reason? Master Jesus: I have always wanted to cooperate from the spiritual plane, in which I am very comfortable. Not because I didn't want to embody in the physical plane, but because in that time I was interested more to connect myself with the causal body of incarnated beings. And it seemed to me I was more useful as a 100% spirit in the plan 4, where I was than being incarnated. Interlocutor: I would ask you a last question and I am not sure if it would be appropiate to ask, since I believe that there are questions that should remain intimate of everyone and nobody has to investigate about it. I refer to Jesus sexual life. Master Jesus: I will only say, brother, before I leave that when I was embodied in Galilee as Jesus I never had problems with my sexuality and I never saw it as something different, I never saw it as something strange either. I simply mean that my sexuality was normal, and when I say that it was normal I want to mean that for me it was never prohibitive, independently that I have had contact or not. Let’s leave it as incognito. I want to go on the record that the only thing I’m interested in nowadays, and what has interested in all times about sexuality, is to have it with love to the other. Everything else has no sense. I repeat, then that sexuality should be made with love to the other, with respect to the other, keeping in mind the other. neither more nor less than that, brother. I ask all my Light to you and to all those that want to follow the Path, and to those who are not yet prepared to follow it, I’m illuminating them little by little so that they could find it. Interlocutor: See you later, Master and thank you. Jesus is talking about Eloah Yahweh a minor god of the plane 8, whenever Jesus mentioned to the Heavenly Father, he was referring to the Absolute EON. This entry was posted at Wednesday, October 07, 2009 and is filed under Biblical mysteries . You can follow any responses to this entry through the .